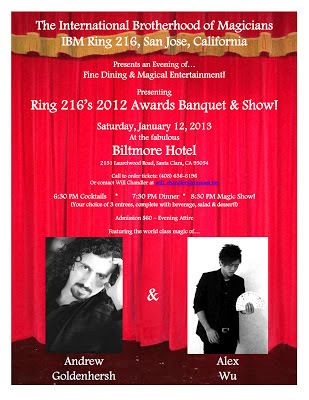 Coming Jan 12, 2013, is the IBM Ring 216 Awards Banquet and Show starring Andrew Goldenhersh and Alex Wu. Tickets are selling fast. Please contact Treasurer Will Chandler for purchasing tickets (treasurer@ring216.org). World-renowned magician Andrew Goldenhersh will be lecturing for us at the Ring meeting on January 9, 2013! NOTE: Remember to pay your annual dues so that you can get in for the member rate! 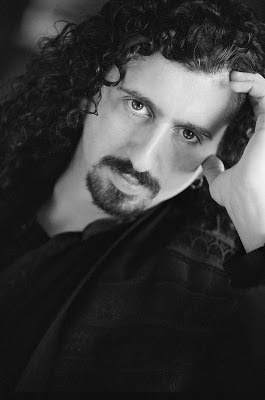 "Pure enchantment...Andrew could entertain the gods." "Awesome...totally awesome! We're going to be talking about you for a very long time..."
"To call this man a magician falls far short of his abilities. Andrew understands the real magic of entertaining." 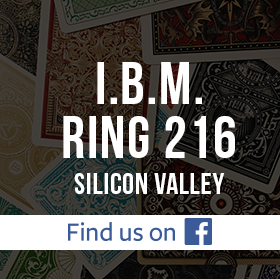 Join us on December 12, 2012, for the IBM Ring 216 Annual Parlor/Stage Competition. The annual election of officers was held on Nov 14th at the Ring Meeting. Each nominated candidate was announced and floor nominations were opened up for each position. There was one floor nomination for Sergeant at Arms (which had no candidate). With only one candidate for each position, candidates were approved with a showing of approval by raised hands. All positions were unanimously approved. This was an amazing night! Four Magi's competed in the Standard Walk Around Competition and three Magi's competed in the Masters Division. In the Standard Division, the club members were treated to amazing performances from Alan Leeds, Aldrian Estepa, David Clavens, and John Jones. In the Masters Division, we received magical performances from Cal Tong, Phil Ackerly, and Theron Schaub! Congratulations to all the competitors for a job well done! 2nd place in the Standard Division goes to Aldrian Estepa, and first place goes to David Clavens! First place winner of the Masters Division will be announced at Ring 216's Annual Banquet. Kainoa, a professor of literature and dream, treated us to some fascinating coin and card magic, and theories on how to be better magician. He has lots of experience performing close up magic and explained how he was able to adapt it to a classroom of 100 students.